Outdoor living spaces have really grown up in the last few years, from patios with simple picnic style tables to fully furnished rooms extending the indoor living space and offering sofas, tables and lamps, kitchens and firepots. Here in Nashville, these "rooms" can be enjoyed from April through October, and even on the occasional 70 degree day in January! The rug and textile industries have met the growing interest in outdoor furnishings with an explosion of new technology and constructions that will outperform the products of the past. Manufacturers continue to offer more designs and colors than ever before. From floral, geometrics, solids and oriental designs, to the popular contemporary styles, these rugs are as diverse as their indoor counterparts. While they can be used anywhere outside, direct sunlight will reduce the amount of time any rug will last. 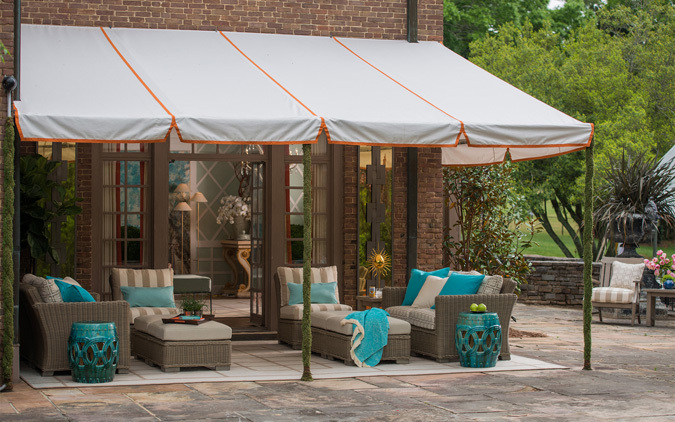 Typically made of polypropylene yarn, UV protected and mildew resistant, a new outdoor rug will offer multiple seasons of use on covered patios and porches. Naturally, these durable rugs should be enjoyed indoors as well, and are truly considered for outdoor/indoor use. Areas prone to get more wear, spills or moisture----the entryway, kitchen, bathroom and laundry room---would be great places for an outdoor rug. They are so much softer and prettier these days; they would even be great for children's rooms and family rooms. Watch Capel Rugs' impressive video and you'll be tempted to place them throughout the high traffic areas of your home. It dramatically demonstrates just how resistant outdoor rugs are to stains and spills. Not only are they durable, washable and scrub-able, but also beautiful. Their Creative Concepts Collection offers custom borders on the popular simple sisal look rug, giving customers even more choices. With so many of our suppliers, such as Kaleen, Nourison, Surya and Momeni offering beautiful outdoor rug collections, it's easy to find something you like. Check out our links page or stop by the store to see these rugs in person.